Virella introduces the solution for better, healthier skin! The BioTonic unit will safely and painlessly remove pimples and debris that often lead to infections and scarring. The new, clinically tested BioTonic Blemish Remover uses a fine, pen-like stainless steel tip to electronically draw out debris without breaking the skin. 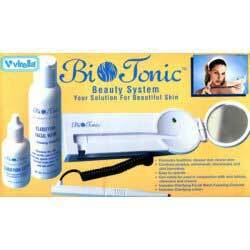 Its effective, as BioTonic gives you on the spot treatment whenever a skin problem occurs. The unit operates with one 9 volt battery (included).